Alyson Hannigan wears white slip on Converse All Star “Chuck Taylor” sneakers in the series. Josh Radnor wears black Varvatos Converse All Star “Chuck Taylor” sneakers in the series. Cobie Smulders wears black Converse All Star “Chuck Taylor” sneakers in the series. 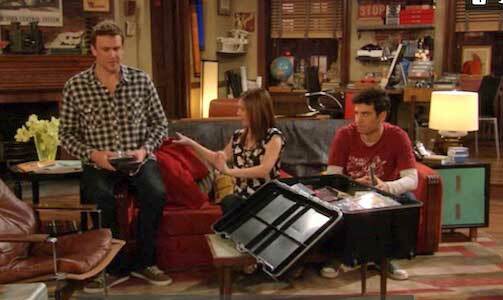 The gang gathers around the coffee table in Ted’s apartment. Life is all about stories. We spend our days trying to create the best ones by having the best experiences we can have. We go on adventures, have relationships, and go through all the ups and downs life has to offer so that one day, we can tell people that life was legendary. We hope to one day impart our experiences onto the next generation when we sit our kids down and let them know the true story of how we got to where we are. The CBS sitcom “How I Met Your Mother” takes the premise of telling your kids the story of how you met the love of your life, and crafts a narrative of what it means to live. The show ran for nine seasons, and starred Josh Radnor, Jason Segel, Cobie Smulders, Alyson Hannigan, and Neil Patrick Harris. Lily wearing white chucks in the episode “Spoiler Alert”. How I Met Your Mother is centered around the lives of five friends: Ted Mosby (Radnor), Marshall Eriksen (Segel), Robin Scherbatsky (Smulders), Lily Aldrin (Hannigan), and Barney Stinson (Harris). The series begins with future Ted (voiced by Bob Saget) sitting his kids down in the year 2030 to tell them the story of how he met their mother. We then follow the gang’s numerous adventures throughout New York City as they navigate the crazy road that eventually leads to Ted meeting “the Mother”. The story begins in New York City in 2006, where Barney and Ted are in MacLaren’s Pub (the gang’s favorite bar) attempting to pick up girls. Ted talks about always wanting to find “the one” and says that she could very well be in this room. It’s here where Ted and Barney meet Robin for the first time, starting her will-they-won’t-they romance with each of them. 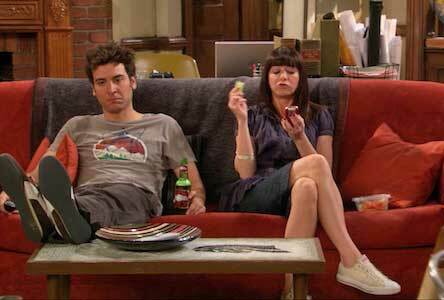 It’s on this same night that Marshall and Lily get engaged after being together for nine years. The lives of all characters are entwined with each other. The series explores many storylines, including the relationships between all five friends and the ups and downs of their careers. 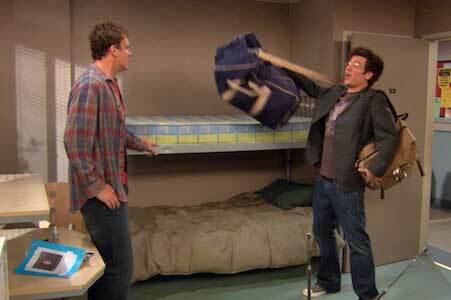 Ted and Marshall in college is always a fun scene. While the more traditional love-story structure would begin where the romantic leads first meet each other, How I Met Your Mother bucks that trend by not introducing Ted’s wife (Cristin Milioti) until the eighth-season finale. They even take it a step further by not saying her name until the series finale. The show instead focuses on Ted’s prior relationships and his dissatisfaction and failure with those women, which makes the payoff of meeting the love of his life way more satisfying. 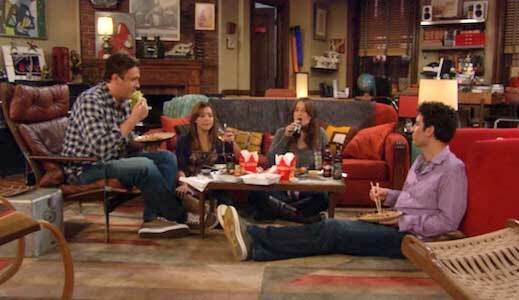 Throughout the show’s nine season run, multiple characters wear chucks including Ted, Lily, and Robin. 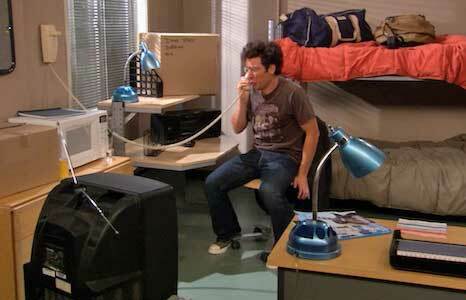 The show is also known for its extreme attention to continuity and running gags. Some of their more famous gags are the Slap Bet, Barney’s ducky tie, Lily’s inability to keep a secret, Robin’s past life in Canada, the goat, the pineapple incident, and the fact that Ted will replace inappropriate words with regular words when telling the story to his kids. Some key episodes to check out are “Slap Bet”, “Sandcastles in The Sand”, “Slapsgiving”, “How I Met Everyone Else”, “Little Minnesota”, “Last Words”, “Something New”, “How Your Mother Met Me”, and “Last Forever”. Ted crying over another breakup. Ultimately, the show is a love story that isn’t really about love. It’s about the journey to find love, and those we meet along the way. It shows that everyone you meet, and everything that happens to you along the way ends up mattering in the grand scheme of things. It might not mean a lot but it still meant something. Seeing where these characters began and then where they end up is rewarding because we see far too often in sitcoms that characters don’t grow over the course of a show’s run. The characters on How I Met Your Mother all mature and change over nine seasons in ways that stay true to who they are. Life’s all about stories, and the story told on How I Met Your Mother is one that deserves to be told because it is legen — wait for it……...dary! Marshall, Lily, and Ted unpacking some stuff on their couch.